Honeybees have survived about 30 million years. This is the only insect that produces food eaten by humans. The honey bee is an insect-friendly environment, very important role as a maid flower pollination. They are insects with a scientific name - Apis Melifera. They have 6 feet, 2 eyes, and 2 wings, a nectar pouch, and stomach. Honey bee beat its wings (more than) 11 400 times per minute, thus making them sound like zzz zzzz. 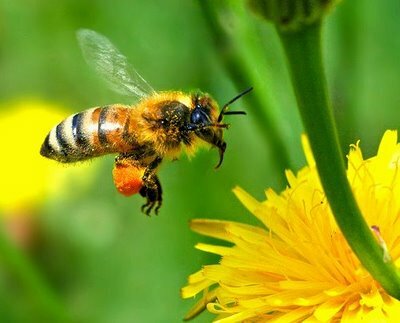 Honey bee can fly up to six miles, with speeds of 15 miles per hour. Honey bees have to fly about 90,000 miles (three times around the world) to make one pound of honey. The average honey bee will actually make only one twelfth of a teaspoon of honey in his life. It will take about 556 workers to gather 1 pound of honey from about 2 million flowers. Honey bee perched 50 to 100 collections of interest during the journey to find honey. A bee colony consists of a single 20000-60000 worker bees and one queen bee honey. Worker honey bees are female, live 6 to 8 weeks of doing all the work. Queen honey bees live about 2-3 years and it works just lay eggs. Busiest in the summer, and can spawn up to 2500 eggs per day. Honey bee males called drones, and they do not work at all, because they do not have the tools, they do just marriage. Each honey bee colony has a unique smell to identify each member. Worker honey bees will only sting if meraka feel threatened, and they will die along with the sting. Queen honey bees also have "penyengat", but do not leave the hive, because to keep survive. It is estimated that 1100 honey bee stings can result in death. During winter, honey bees eat honey which they collect themselves in the summer. In winter they also form a tight group to keep the queen bee nest itself and warm.